By Constance Anderson Tate, World Service Council Chair and World YWCA UN Volunteer. Today was a beautiful end-of-summer day in New York and yet not really a normal day at all over at the United Nations – more of a totally inspiring one! Some five hundred young people had lined up in a block-long queue at the gate by ten o’clock and later filled every seat in the large Trusteeship Council room to hear Pakistani student Malala Yousafzai and Secretary General Ban Ki Moon share their strong thoughts about educational goals for women and hopes for the world’s future. For those of us who accompanied five young Afghan women students to the event, the session was also a reminder of the dangerous conditions facing girls in many countries and the harsh or challenging road that lies ahead for so many. 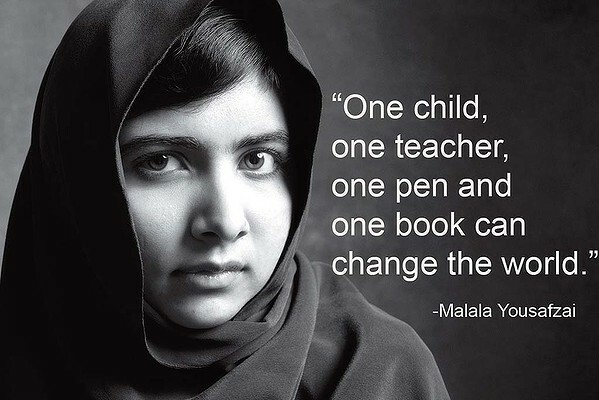 Malala spoke just as strongly about her dream of seeing every child in the world able to go to school but also of the bad conditions that she has seen in her recent months of travel and trying to help with the Malala Fund that has been created in her honor. She spoke of seeing many of the 100,000 Syrian refugees in Jordan with 60,000 of them being children who now have no school. Also of her own country Pakistan, where so many girls are stuck in domestic child labour and never have a chance at education or a life before they are married off at age 13 or 14. As a contrast, she then held up the country of Trinidad and Tobago where oil and gas revenues have been used so that every person in the country gets a FREE education. As she concluded to great applause, this should truly be the goal for every country. As Ban Ki Moon and Malala spoke, the youth audience of all nationalities responded with many of their own questions and goals, asking how to take first steps and how to protect girls and women? When the moderator asked for one-word suggestions of how Malala has helped the causes of youth and progress, one of our Afghan girls who is only 14 years old gave a cheering reply with the word “hope”, saying that Malala with her courage has given girls the world over some hope that they matter and can have real lives of contribution instead of just being property and trapped in early marriage. Others mentioned such words as “drive” and “change,” and one of the leaders encouraged the audience to chant the words ”momentum” and “time for action” to help get the United Nations moving on these goals. While the programme ended after only an hour, it was an impressive show of youth interest in the work of the United Nations and the impact that both Malala and Ban Ki Moon are having in such forums as courageous and outspoken leaders. Also, while Malala was obviously speaking about women’s rights and equality, the audience held a large number of boys and young men, several promoting causes such as the curbing of sexual violence. So the outlook was unusually positive – even while many who attended know that the UN’s Millennium goals will expire in 2015 and urgently need reenactment; also that the UN is facing a heavy dose of acute political problems that can sidetrack or slow down such humanitarian concerns and efforts. As for our Afghan girls, they were thrilled to meet with Malala, both formally and also outside for some cherished pictures. One or two even spoke to her in Pashtun, a language shared by neighboring sections of both their countries. Since all five of our students attended a special school in Kabul called SOLA and have made remarkable progress in learning English and in being accepted in the United States for either high school or college, they are walking examples of the goals that Malala and Mr. Ban Ki Moon were both promoting. And it was thrilling to be part of such a scene here in New York, seeing the challenges for world cooperation and education as well as a sample of how it really can work and offer hope for us all.